Apple has released the GM build of macOS High Sierra to Mac users participating in the developer preview and public beta testing programs. GM stands for Golden Master and typically represents the final build of what was beta software that will become the public release. 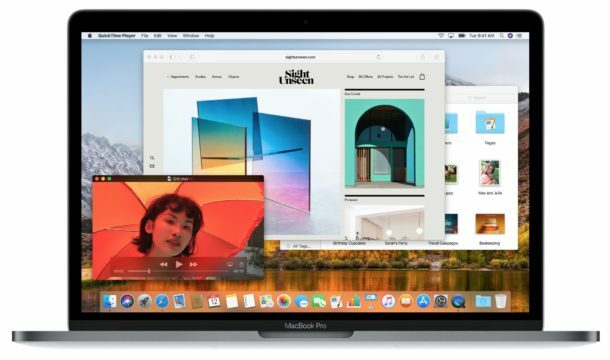 macOS High Sierra includes the all new APFS file system, speed improvements to Safari, new features added to the Photos app, a newly updated Siri voice, updates to underlying graphics technologies, and a variety of other refinements and improvements to the Mac operating system. Any Mac user who is enrolled in either of the beta testing programs can find macOS High Sierra 10.13 GM available to download now via the Updates section of the Mac App Store. Always backup a Mac before installing any system software update, whether it is a beta release or otherwise. For those wondering, MacOS High Sierra 10.13 is compatible with all Macs that support the prior release of MacOS Sierra 10.12. MacOS High Sierra has a release date scheduled for September 25, though the impatient can enroll in the High Sierra public beta testing program and access the GM build now. iOS 11 GM is available to download now too via the beta programs, before a September 19 public release. It’s the GM Candidate, not yet the GM. So, are Mail problems fixed in the High Sierra GM? Mail is unusable to send emails and very slow to receive emails. My personal decision (and recommendation) is to wait until macOS High Sierra 10.13.1 or 10.13.2 or later comes out. Changing the file system is no small task, and updating system software can lead to all sorts of annoying problems if it is buggy or goes wrong. I always wait for the first major software updates now, I do not risk the early first releases on my necessary hardware. If you’re having difficulty with existing beta versions, you can try out the GM but my experience suggests it’s the .1 and .2 and .3 releases where things get fixed and more stable. Excellent advice Dave!!!!!! I NEVER update an OS or iOS until there are at least 2 updates to the initial release and I read of few issues for my usage. Does APFS support normal hard drives yet, or is it still SSD only? No AJ according to the release docs normal and fusion drives are still not APFS supported. I tested the public beta on a Macbook Pro with a standard hard disk and it ran fine when converted to APFS. Didn’t notice any difference but it worked just fine. Don’t listen to anyone here. Educate yourself. That what the internet Late 2017 is all about. APFS does not support normal hard drives or Fusion drives according to the release docs. Sad as I have a 2014 iMac 5K and cannot run the latest OS because of this. I don’t want it just for the other stuff. I want the faster file system but it looks like Apple has failed this time. Very disappointed. You can run the OS, it will just keep using the older HFS+ file system rather than APFS. I’m on Public Beta program. Just checked App Update again at 11am Pacific. Still no prompt for update. You have to download the beta tester app and download the full installer from the App Store, it doesn’t come through software update. I can’t complete the install because the installer won’t recognize my mouse. Any tips anyone? Background is that I have a Fusion drive formatted for AFS. Since that’s not supported with Fusion drives in the initial release I’m trying to follow Apple’s instructions to boot from the GM Candidate Installer on a USB drive so I can reformat. I’ve tried 2 different Apple Magic Mice and a hard-wired generic USB mouse with the same results. Help very much appreciated.